(a) Make sure that the CD is an audio CD or a CD with an MP3, WMA or AAC file, and that it is not deformed, flawed, stained, deteriorated or otherwise defective. Translucent or uniquely-shaped CDs cannot be played. CDs with adhesive paper labels should not be played. Commercial audio CDs can be played. CD-DA files on CD-ROMs, CD-Rs and CD-RWs can be played. MP3 and WMA files on CD-ROMs, CD-Rs and CD-RWs can be played. For details on playable CDs, refer to the Owner's Manual. (a) Check whether or not the CD is inserted upside down. 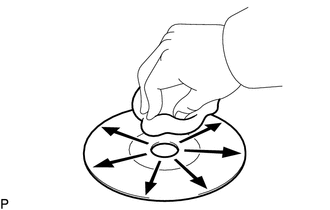 (1) If dirt is on the disc surface, wipe it clean with a soft cloth from the inside to the outside in a radial direction. Do not use a conventional record cleaner or anti-static preservative. (a) Replace CD with a known good one and check that the malfunction disappears.